In today’s frantically busy world of family, job and life responsibilities, homeowners can hardly be blamed for feeling overwhelmed by the added stress from Mother Nature! The year-round cycle of property care burdens is significantly reduced by the professional expertise of experienced caretakers whose job it is to keep lawn, shrubs, gardens, and trees in prime condition. After the work-week is over, and residents return home for some much-needed relaxation, the last thing they need is a yard full of chores to be done. 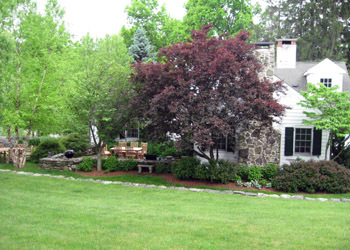 Our program of property maintenance can alleviate unnecessary anxiety so free time can be devoted to family activity and the pleasures of living in the serene beauty of the New York and Connecticut countryside. A rural landscape may be resplendent with trees and shrubs of every size and description, many of which may require remedial attention due to storm damage, infestations or just old age. Our crews have years of experience in addressing such needs, from judicious pruning, to removal and replanting.